Bring to life the great shopping experience that people love, offered by Carrefour! There are brand that are loved, and some that are respected. Carrefour is one of the few “Lovemarks” - it’s both loved and respected. In Romania and elsewhere in the world, when a shopper enters a Carrefour, he/she feels a real excitement. Carrefour is part of people’s lives, people feel close to it. 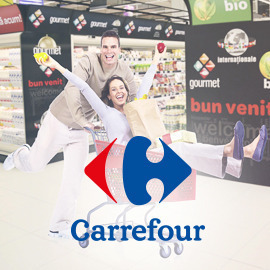 The current slogan for Carrefour in Romania: “Carrefour, For a better life!” does not reflect the key points of difference: pleasure during shopping, modernity and innovation. Indeed, Carrefour is different from the others because it has a purpose: it offers a shopping experience that people love. Enter a Carrefour in Bucharest or elsewhere in Romania and you will feel it. Can you help Carrefour communicate what it really stands for: a great shopping experience, beyond the obvious must-haves of good prices and good locations? Design an impactful poster and a slogan that shows that Carrefour is a unique place for fun and fulfilling shopping experiences and a retailer that people are really attached to. Format: Two pages: one page with your poster and slogan, one page with explanations and implementation ideas.